Tonya works with all ages & backgrounds! Her specialty is youth, parents, families & schools, especially with ADD, Autism spectrum and trauma healing. Her training is extensive. She has well over 500 hours with YogaFit and 100 hours with Aura Wellness. 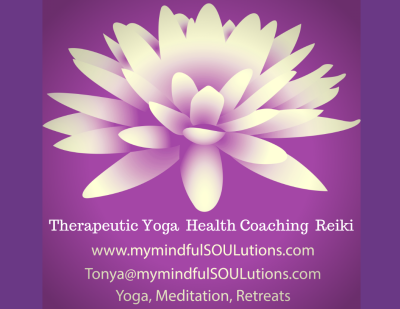 She holds numerous certifications in health & wellness coaching, fitness, Reiki, feng shui and medicine wheel. Tonya is also trained in the Mindful Schools curriculum, and has completed graduate work in Incorporating Mindful Education into Curriculum. She also holds a certificate in Executive Director Leadership. Tonya earned a bachelor's degree in Biology and a master's degree in Life Science Education. Tonya empowers you to thrive where hard-core science and ancient traditional wisdom meet! Through local grants, Tonya has been able to serve River Falls Public Montessori and Meyer Middle School. Other schools are in the works. 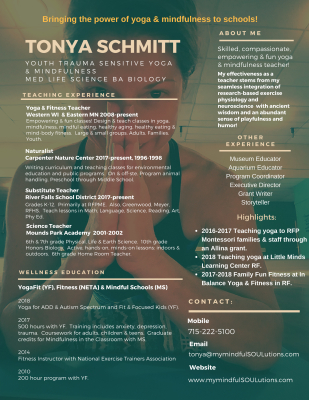 At times, Tonya has volunteered her time to write grants for schools to serve them with mindfulness and yoga. Tonya has also been or still is a: science teacher, naturalist, environmental educator, executive director, program coordinator, parent educator and support specialist, among other things. Tonya is fond of these things: playing in the leaves with her kids, going for walks in sub-zero temps with her husband, music in the park along the river and yoga practice by the fireplace. Also--creating household items out of found natural objects, and dancing spontaneously!